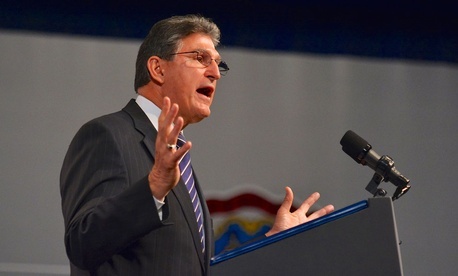 West Virginia Democratic Senator Joe Manchin criticized the administration's efforts to regulate carbon emissions from power plants and urged the federal government to listen to market signals when investing in new energy technology. "There are those of us on both sides of the aisle that believe that there's an overreach by the EPA," Manchin said at an event hosted by National Journal Wednesday. Referring to the Environmental Protection Agency's new rules for future power plants, which will mandate the use of carbon capture and storage technology, he added: "We don't have the technology to get us there and they are going to say that if you don't get there you can't do it and it doesn't make any sense whatsoever." Instead, Manchin called for greater collaboration between the federal government and the private sector so that public investment can be used to support what he says are more viable technologies. "You can't force a round peg in a square hole," Manchin said. Manchin also said the administration has not done enough to solicit feedback before making determinations about where to invest in research and development and deciding which policies to promote. He mentioned the EPA's decision not to stop in West Virginia, one of the top coal-producing states, during its public listening sessions on upcoming regulations for existing power plants. The EPA has said those sessions were aligned with its regional offices in cities like San Francisco, Boston, Atlanta, and Philadelphia. "Let me ask you this: if you wanted to find out what was going on and you wanted some input and you were the new director, would you go to the states that produce most of the energy?" Manchin said. "There's not one of those field hearings scheduled in West Virginia, not one, and all we said was please come, listen to us and let us listen to you." "You identify a problem first, then find commonality, then find a way to move forward and that's all we've asked for," he added. "If this government is going to its comfort zone and not where the real problems are, where the rubber meets the road, then they've got a real problem.